Waving placards reading “nuclear go zero”, and “abolish nuclear, save Taiwan”, they gathered outside the presidential office in Taipei on the same day Japan marked the seventh anniversary of the Fukushima disaster. Taiwan’s cabinet-level Atomic Energy Council recently decided to allow state-owned energy company Taipower to restart a reactor at a facility near Taipei, pending parliament’s final approval. The reactor has been offline since May 2016 after a glitch was found in its electrical system, which the company said had since been resolved. Anti-nuclear groups are now questioning whether Taiwanese President Tsai Ing-wen’s Democratic Progressive Party (DPP) will keep its promise to phase out nuclear energy. “It would be violating the spirit of creating a nuclear-free homeland by 2025 pledged by the DPP,” said Tsui Shu-hsin of the prospect of restarting the reactor. Tsui is the spokeswoman for the Nuclear Go Zero Action Platform, which organised the rally. Lawmaker Huang Kuo-chang, head of the opposition New Power Party, echoed the sentiment. “The government should move forward, not backwards and restarting the reactor would be a regression,” he told reporters at the rally. 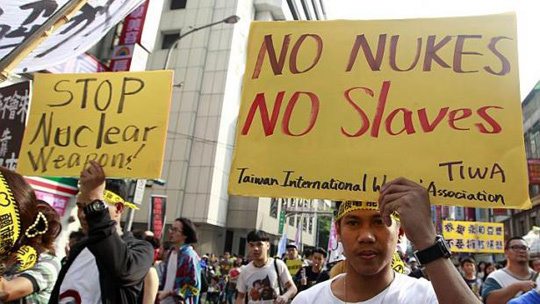 …….Taiwan started annual anti-nuclear rallies to commemorate Japan’s nuclear disaster on March 11, 2011, when the Fukushima energy plant was hit by a tsunami following an earthquake, knocking out power to its cooling systems and sending reactors into meltdown. Taiwan, like Japan, is prone to frequent quakes as the island lies on a number of fault lines.